According to preternaturally plugged-in celebrity real estate snitch Yolanda Yakketyyak, it was Dennis Quaid, now separated from his third wife and dating a leggy model more than half his age, who shelled out $3.9 million for a freshly rebuilt contemporary at the end of a long but little-known cul-de-sac in L.A.'s well-to-do Brentwood Hills neighborhood above Mandeville Canyon. 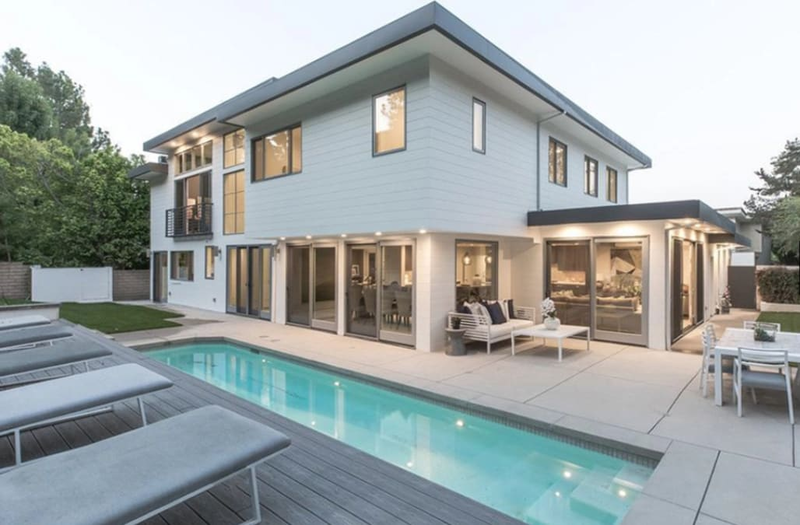 The sleek dwelling, just over 4,100 square feet with five bedrooms and 4.5 bathrooms, is arranged around a cavernous, double-height central gallery flooded with natural light through towering walls of glass and a massive skylight. Just inside the front door, an intimately scaled living room has a fireplace set into a smooth-paneled wall and a room-wide bank of floor-to-ceiling glass sliders that lead to a fenced courtyard garden. The dining room, with glass sliders to the backyard, features slim wood beams on the ceiling and is open to a chef's kitchen and family room. A bridge crosses over the central gallery to a master suite replete with fireplace, private sitting room and spa-style bathroom. The backyard offers a built-in grilling station and a long, slender swimming pool. Quaid, scheduled to appear as President George W. Bush in the next season of "American Crime Story," once owned a multi-million-dollar mansion in Austin, Texas, as well as a 418-acre country spread along Six Mile Creek outside Emigrant, Mont. He continues to own a 6,100-square-foot, 1920s Mediterranean in the ritzy Riviera neighborhood of Pacific Palisades, Calif., picked up in July 2013 for $5.1 million.